Certified Green Guide Helen Cooper has always loved butterflies. She is a native to Wakulla County and grew up chasing butterflies near her home in downtown Crawfordville when children could run in the street by the Courthouse because the only traffic was on the weekend when folks drove south to the coast. She is a descendant of the Roberts and Tuckers on her daddy’s side, and kin to the Taffs and Carraways through her mama. If you live around these parts, you will know the generations of these longstanding families. If not, a drive through the county will quickly acquaint you with these names familiar on street signs, assorted businesses and buildings. Helen became a Green Guide through the Tallahassee Community College Ecotourism Institute because she is drawn to the outdoors and the discovery of details specific to area flora and fauna. She especially enjoys nature photography. It was at one St. Marks National Wildlife Refuge Monarch Butterfly Festival several years ago when Helen went to photograph butterflies, that she became enamored with the beauty of the monarch. Soon afterwards, she became a volunteer for the Monarch Project where she learned to count, capture and tag monarchs travelling on their epic 2,000 mile journey from the northern American boundary to the mountains of central Mexico. 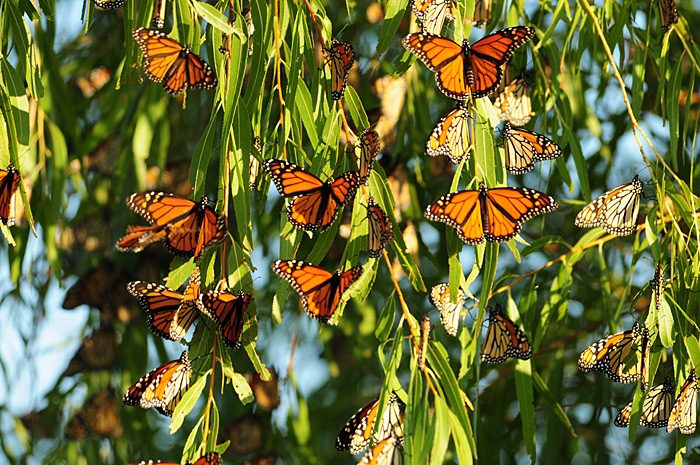 Millions of monarchs pass through the river corridors and along Florida’s Gulf coast to get to a certain 70 square mile forest located in central Mexico. It takes four generations for the butterflies to finally reach their destination where they spend their winter hibernation in the very same trees each and every year. This incredible migratory phenomenon happens here in our area beginning about the third week of October and lasts until mid-November. “When you help others, you help yourself,” says Helen insightfully. I was born under the sign of the fishes in the “Sunshine City” of St. Petersburg, Florida. I learned to swim about the same time I learned to walk. My mother took me across busy 49th Street to the pool of Mrs. Neal where all the neighborhood children went to master the basic skills of swimming. The Neal family had an up close and personal connection to water. Mr. Neal was a plumbing contractor who repaired the problems adults encountered with water. Mrs. Neal was a swimming instructor who averted the problems children might encounter with water. There was lots and lots of water and we were surrounded by all types - salt water, creek water, lake water, river water. A few years later I eagerly anticipated our travels to the waters of Weeki Wachee Springs where I fell in love with the live mermaids. The way they appeared to swim so effortlessly suspended like magic inside a wonderful crystalline water globe captured my Pisces heart. The sun shining rays of light that reached down from the surface to the watery depths, graceful tails sparkling, exposed skin shining luminescent. I watched in rapture. Back at home, the favorite color of my mother decorated our living space in gentle shades of turquoise and aquamarine. 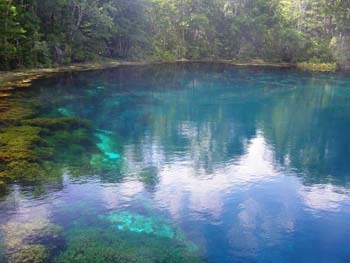 I imagined myself happily immersed underwater in these colors of liquid blues and greens. In the quiet darkness of the night, I secretly dreamt I too was a dazzling mermaid. Whatever the lure of a lighthouse standing steadfast in a place suspended between the sea and the sky, anchored on the very edge of land and water, a lighthouse is where history and legend meet. As a tower of strength safely guiding ships through the darkness of night and turbulent storms, a lighthouse seems characteristically noble, a reflection of the stalwart keepers who once faithfully kept the lanterns burning and the lighthouse alive. Our modern day lighthouses, witnesses to evolving technology, are now illuminated by electricity and fully automated. Sadly, the services of lighthouse keepers are no longer needed except for the rich maritime history they so significantly provide. 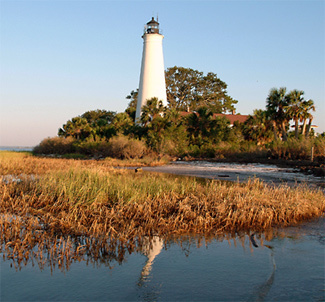 Florida has over 2,000 tidal shoreline miles, so it is not unexpected that a great number of lighthouses can be found marking our coasts. The Forgotten Coast is home to four of these exceptional towers, each with their own colorful place in Florida maritime history.